The Loew’s 46th Street Theatre opened on October 9, 1927 as the Universal Theatre. It was designed by John Eberson, a famous theater architect known for his atmospheric style auditoriums. According to an account in the Brooklyn Eagle, 25,000 people were present for the opening of the theater. 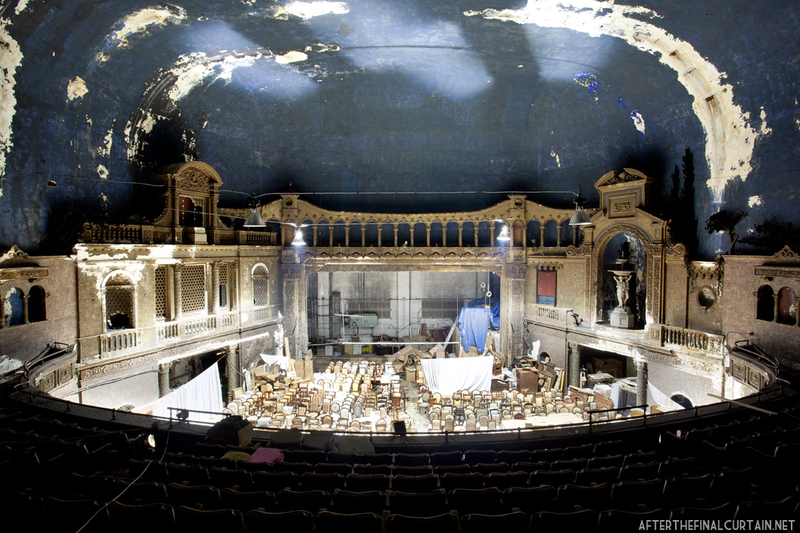 The 2,675 seat theater was acquired by the Loew’s Corporation in August 1928, and closed so renovations could be made to the sound equipment. 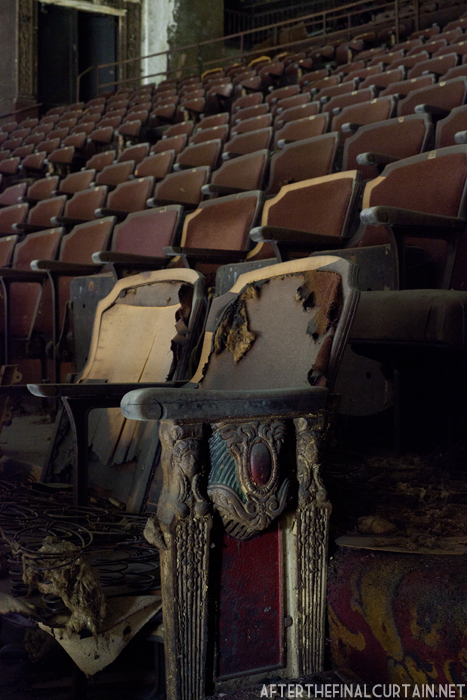 It reopened on September 10, 1928 as the Loew’s 46th Street Theatre. This fountain actually worked. It helped to add to the illusion that patrons were sitting in a garden at night. The 46th Street Theatre was the first atmospheric theater in New York City. It was designed to look like a night sky in an Italian garden. The illusion was completed with a projection of clouds across the ceiling. However, by the 1940’s the atmospheric effects had fallen into disrepair and were no longer used. 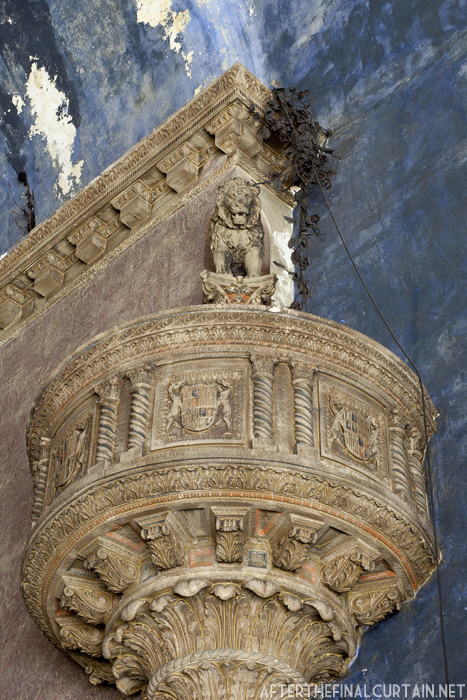 View of the balcony level. The Loew’s Corporation transferred ownership to the 46th Theatre Company on September 14, 1966, and the theater was run as an independent movie theater until it closed in 1970. It was reopened later that year as the 46th Street Rock Palace, and was later renamed Bananafish Garden. The name was taken from J.D. Salinger’s short story “A Perfect Day for Banana Fish”. Many famous bands played shows at the theater during the years it was a concert venue including; The Byrds, The Grateful Dead, Jerry Lee Louis, The Bee Gees, Steely Dan, Gladys Knight and the Pips and Randy Newman. 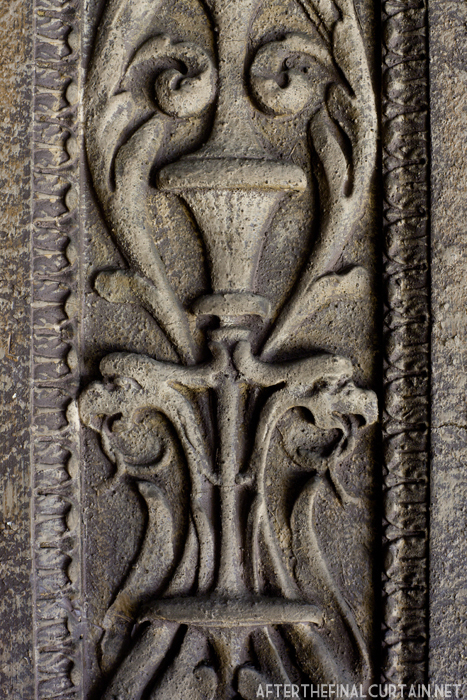 A close up of some of the plaster work that adorns the walls of the auditorium. 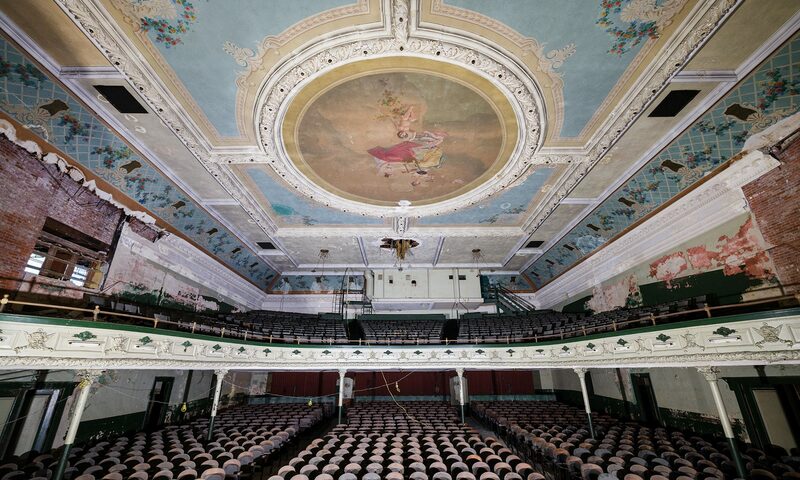 In 1973, the theater was closed due to pressure from the local community, who felt that the concerts were causing too much noise. The building was then sold in 1974 to a furniture company. The stage was removed from the auditorium and it was converted into a storeroom for surplus furniture. The lobby was converted into a show room. Unfortunately, the theater was demolished in late 2015/early 2016, and the site is slated to become condominiums. 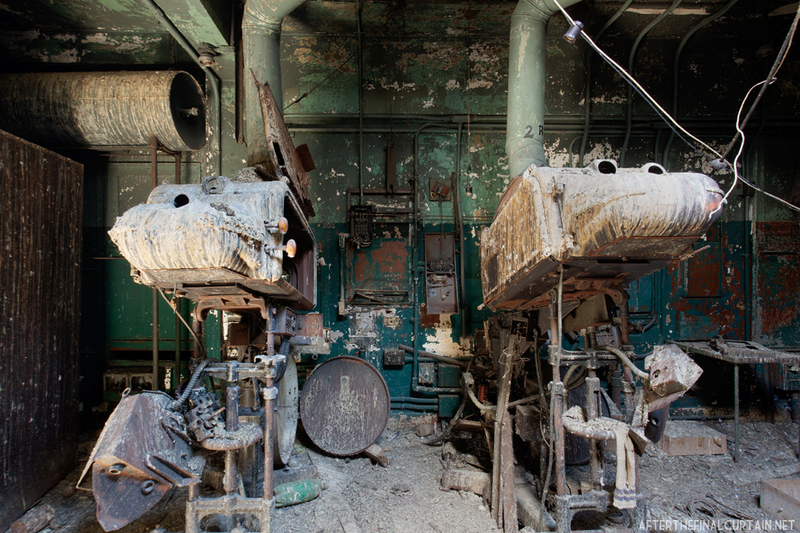 Birds have gotten trapped in the projector room over the years, leaving the floor covered in bird droppings. The sides of the seats were also ornately decorated. 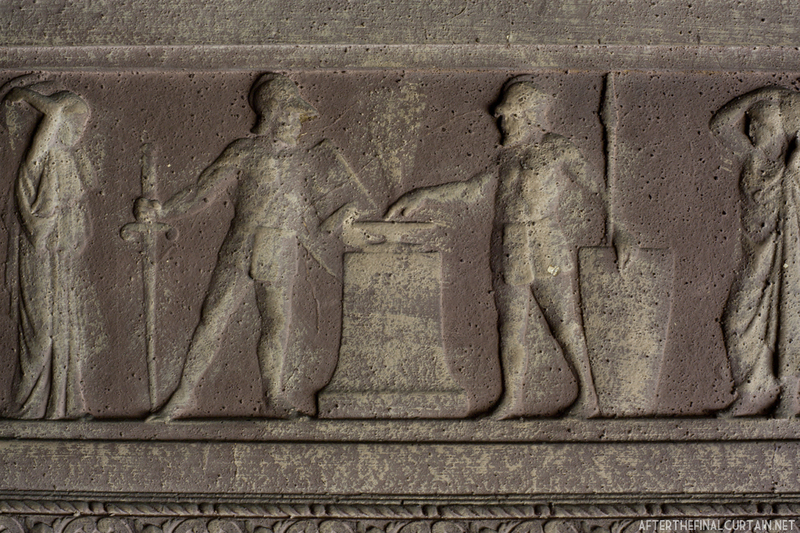 A close up of plaster work on the wall of the auditorium. Another view of the fountain. 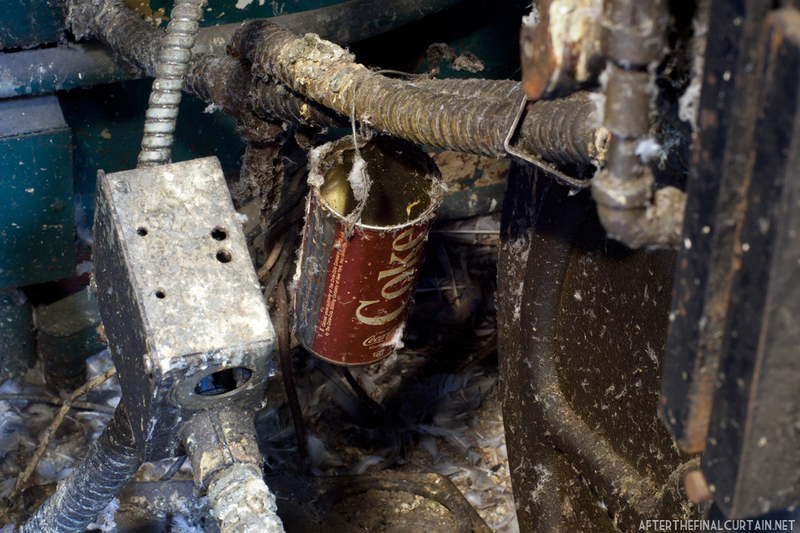 One of the projectors was leaking oil, and a coke can was used as a makeshift oil pan. A close up of the plaster work around the fire escape doors. I cringe when I see a new post from you. I brace myself to be so saddened by your exquisite photography. The lighting of the stage in this post is particularly striking. Thank you so much for your dedication to this documentation project. Tom Schantz says it all for me! Thank You! This building was pretty incredible. Thank you for featuring it. That was art – they don’t make buildngs like that anymore. I wish I could buy it and restore it! it would be nice to go back after all these years. Spent many days in this building as a youngster, watching movies all day for one admission..then later on saw most of the rock shows that came through. 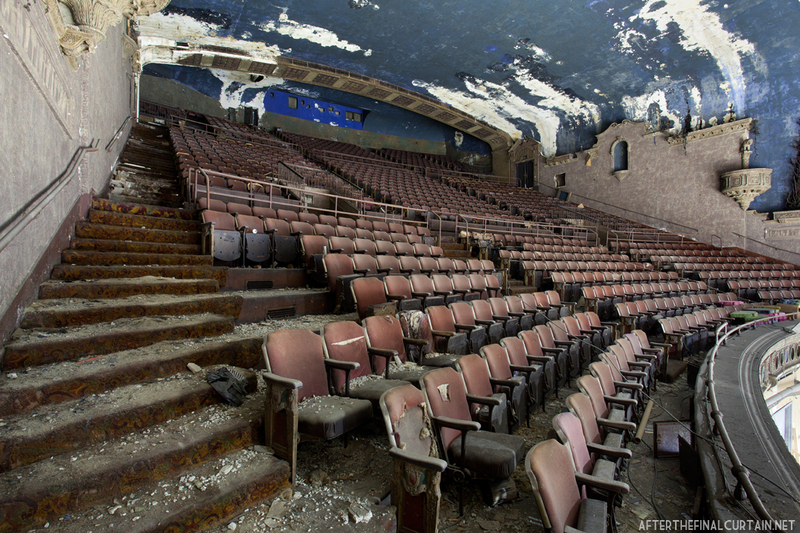 This theater is in much better condition than those which yet exist in the Detroit area. The fact that the fountain and many of the details still exist at all amazes me. I know nothing about construction, but what would it take to restore something in this condition? Would there be a use for it–other than for furniture storage–in the area in which it exists? 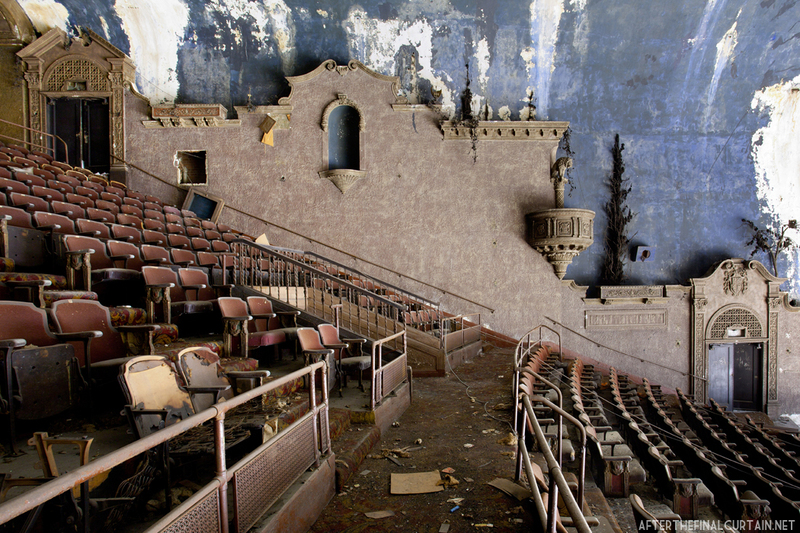 It’s actually not in that bad of shape when compared to some of the other theaters I’ve been to. However, the neighborhood probably wouldn’t support the building as a theater. 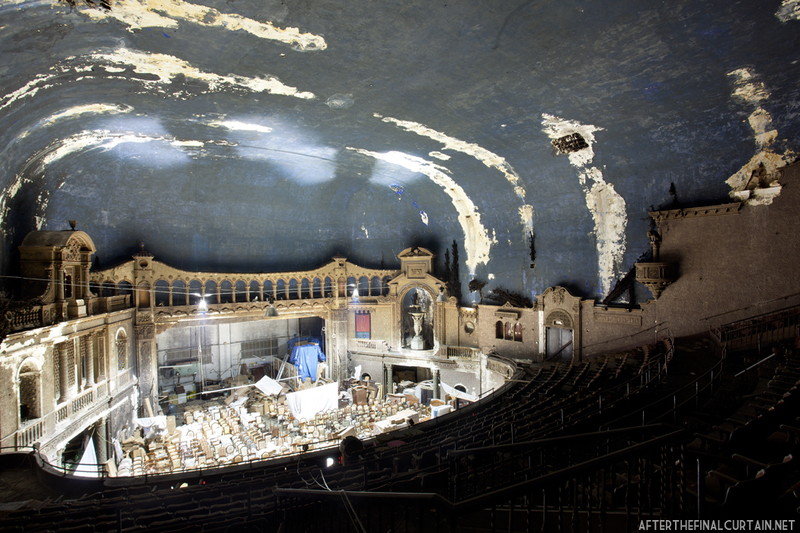 That’s actually a different theater – The Loew’s Pitkin in Brownsville, NY. Such a sad state to see. Why doesn.t somebody do something constructive and save this beautiful lady. Who owns this place now? I spent many hours of my 1960’s youth in that movie house. 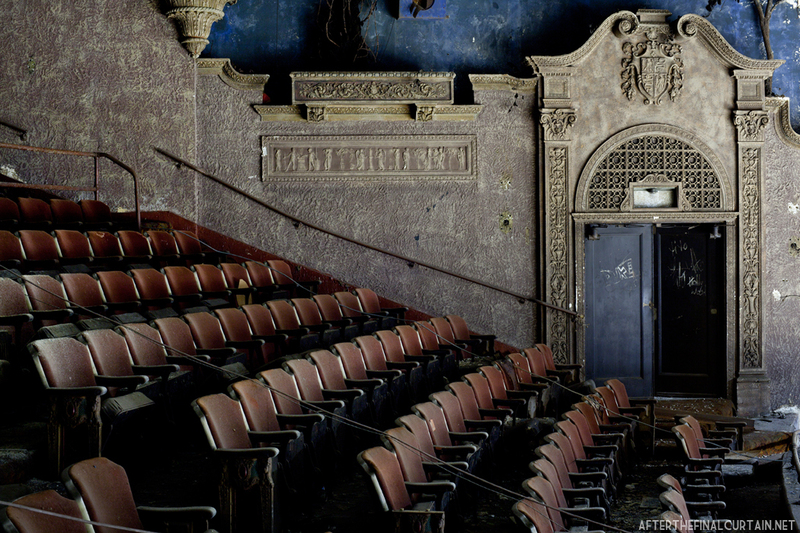 It was beautiful, winding marble stairs,wood carvings plush seats;it truly was a “Movie Theater” the likes of which you will not see again. I feel like I am looking at pictures of ancient Rome after its fall.I am surprised the new owners gave you access to it. The Loew’s 46th Street was home to mostly Metro Goldwyn Mayer and Paramount pictures after they played in the “City.” If you couldn’t catch the shows at the Radio City Music Hall, the Loew’s State, Capitol, etc., this was the place or palace to see them. It was a glorious movie house, with a matron to calm the kids at the Saturday afternoon shows, and the home of Happy Felton’s Knothole Gang on a Saturday mornings. For a kid like me in the 50s, it was magical. I didn’t know a thing about architecture, all I knew was that for a quarter (If I remember correctly), I was transported from my tiny apartment into a fairytale castle the likes of which was beyond my imagining. I remember going there by myself to see “Quo Vadis,” and with my parents in 1952 to see “The Greatest Show on Earth.” What memories. What splendor. To see what fate had in store for this dream palace makes me sick. Why do we treat our glorious past with such disrespect? Does everything grand and good have to end up this way? Of course, these are rhetorical rants with no answers. But I feel better for letting it all out–in glorious Technicolor and Vista Vision! Grew up on 44 st Bklyn. Spent a good part of my youth in that theatre. (1952-63) Saw Jerry Lewis live there promoting “Don’t Give Up The Ship”. Saw all those Japanese horrors there. Saw “The Birds” there ,,, sorry the memories are flooding back ..every week was a double feature..I think it was .50 cents admission ..sometimes we would go down to the RKO 4 blocks away..parents wouldn’t let me go see “Psycho”.. great photos.. never really appreciated the beauty when I was young ..it’s a little run down ..its glory days well behind it . its so sad … I am theatre and it is me. Hi, please get in touch. I am interested! It was indeed Fioretti’s. I worked in there myself, as a teenager. Talking about the mid to late ’80’s. I unfortunately was born the same yrat this place closed down as a theater. I always remember it as Klein’s Furniture Store. ahh……and they were all Healthfully Air Conditioned!! What memories of Lowe’s 46th theater. I live @ 4719 – 11th Avenue B’klyn. Just a couple of blocks away from the theater. I hung out on Alben Sq. with some of my friends of the neighbor hood. I lived in the neighborhood from 1949 to 191959 those were the greatest days of my young boyhood. I played stickball on 11th Avenue & 44th St. If you played the outfield and looked to the left you would see the Lowe’s 46th street theater. I remember seeing Don Rickles doing his show at the theater. Most of my friend live under the ell on New Utrecht Ave. betweet Fort Hamilton P’kway and 50th St. I took up boxing in a club run by lightweight champ Patte DeMarco. Called the LAMPLIGHTERS BOXING CLUB. It was right across the street the the BORO PARK THEATER. Good GOD those were the days. And the Lowe’s 46th theater where my and my friend would sneak into on Saturday most the time. One guys would pay and then open up the side door and leave the rest of the guys in. Now I’m living in Las Vegas with my wife and my son and daughter-in-law. My band opened for the Chambers Brothers there in sept 1970. It was a beautiful place then. Hey Ray what great memories I lived at 4121 fort Hamilton parkway and was lucky enough to enjoy being behind the scenes of all the concerts meeting the performers and playing drums with the big acts during sound checks. Stopping for an eggcream at the luncheonette under the train station at 46th st,and hanging out at the square with all my buddies.Can’t forget getting a canolli at Piccolos bakery. Wouldnt trade it for much else. Hello everyone. Just wanted to let you know that this theater is currently being demo’d. After years of being home to s furniture company, it was sold to a developer. It is slated to become condominiums. I was in there today and all that is left is the walls. Every last piece of ornate design has been torn down and turned into rubble. All that remains as any resemblance to a theater is the opening where the stage was and the iron work that held up the mezzanine level. It was one of the most depressing sights I have ever seen. Yeah, I spoke with the owner about it over the summer. It’s a shame they demolished it as it was in pretty good shape. Not all of the ornate plaster was demolished though. 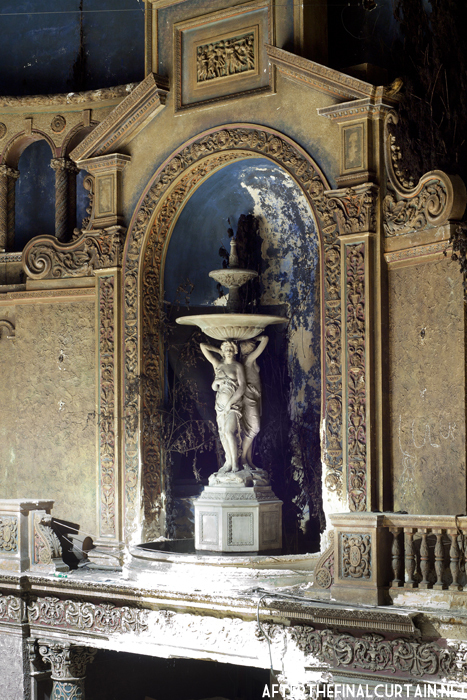 Some of it was removed and sold to a private party before demolition began. Go for it! Are you working on the site or just a passerby? Bummer. Saw and worked some good shows both as 46th st and Bananafish Gardens. The Lowe’s 46th was simply elegant. I went regularly as a young teen between 1954-1958. I usually went on Sunday afternoon because that was the time that young couples and families dressed up. Everything about Brooklyn (Boro Park) seemed so grown up and classy. The lobby artwork and thematic sculptural works throughout were beautifully executed. Every inch of floor space was covered in this deep red patterned broadloom. What a space it was. The high point of the afternoon of course was when you saw and was seen by one of the young girls on which you secretly had a crush (went to Catholic School OLPH) gaze in your direction as she entered the lobby accompanied by mom, dad, brother or sister. Loved it all and it is probably why during my professional career traveling the globe I have always sought out the best Philharmonic and ballet venues in European cities. It was a fantastic space. I could see that even in the state it was in when I photographed it. Unfortunately, it was gutted a few years ago. this was my neighborhood loew’s grew up going here in the 50’s and 60’s a shame to see what it became my father’s luncheonette was a few blocks away. I saw so many films here. Last I heard it had been demolished to make room for an apartment building or Condo. Yes, that’s exactly what happened. I believe the facade is still there though. 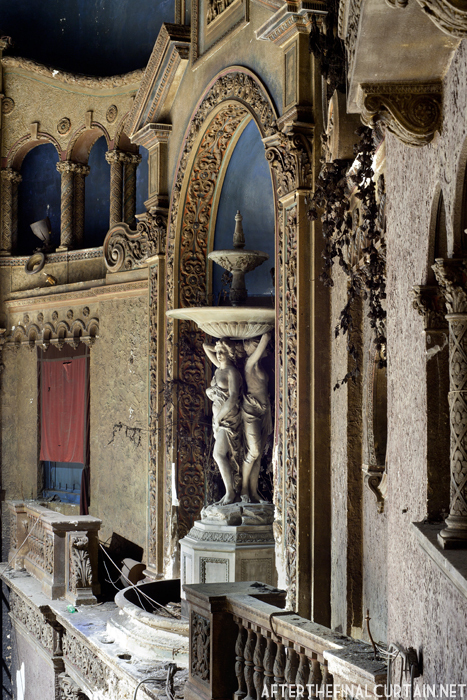 It’s a total shame that these beautiful theatres are being demolished. There is a web site that has a list of almost every theatre ever built and what their status is. Cinema Treasures. It has dates capacity # of screens # of seats. Born and raised in Bay Ridge/ Boro Park, grew up in the ’50s and spent many days at the 46th st theater as well as the Lowe’s, Boro Park where I would buy a pastry across the street at Luigi Alba’s as well as Piccolos near the 46th. There was also a candy store on the corner, next to the theater where I would load up on Goldenberg Peanut Chews before going in. Spent many a Saturday night at the 46th with my girlfriend, (now my wife of 55 years), who lived on 45th St between 12th and 13th Ave’s and went to Catholic School at St. Catherine’s of Alexandria before I joined the Air Force in 1959. I remember also going to the other 2 theaters on New Utrecht Ave, The Normandy, which was rather dinky, and the New Garden, which was a rat-infested hole that I only went to once. But my favorite, (go with my buddies), theater was The Ritz, on 8th Ave and 46th St.
Saturdays with 2 Westerns, 3 Serials, 10 Cartoons and sometimes a live Duncan Yo-Yo Show with yo-yo’s for sale after the show. No doubt about it. Growing up on 42nd St between 8th and 9th Ave’s from when I was born in 1942 till I left for the service in 1959 was the happiest time of my life. From my first memory at 3 years old of the VE Day Block Party on our street in 1945 to giving my girl my High School Ring before I left for the Service in 1959, Brooklyn memories will be cherished most. Let’s talk 13th Ave, from 39th St. to New Utrecht Ave. The smelly Chicken Market, where my Kosher neighbor sent me on Fridays to buy a chicken, (and gave me ten cents), afraid to watch how the necks were broken though. Scotto’s Bakery. Best Italian Bread and pastries. Lennie’s Pizza on 42nd St., 15 cents a slice. Charlotte Ruse from the store on 43rd St.
Oh! I forgot Red’s, the Italian restaurant just off of the Culver Line on 38th St.
Tom McCain’s shoe store 44th to 45th where I bought all my shoes, (loved the ones with the spring top). And so many more, but one of my favorites was Ebinger’s Bakery, (48th ?) St. home of the Chocolate Black-Out Cake, yum !!!!. Thomas ..the total neighborhood 1952-58 for me covered Sunset pool on 44th & 5th all the way down to 60th St and 8th Ave. Lived on 54th and 8th Ave. Played hockey with Ray Millers NY City Parks Department teams on 53 St and Fort Hamilton Parkway… The Boro Park, Lowe’s 46th, the Ritz and the Berkshire on 60& 8th Ave.were my movie haunts. Could write a book ….no several volumes. It really was fun growing up in that polyglot of religious and ethnic groups…except for the occasional fist fight of course. The Sunset Park Pool. Loved it, and was there almost every day in the summer. Always stopped at the candy store on the corner at 42nd St for Pretzel Rods on the way home. Swimming made you hungry. Went to P.S.169 on 7th Ave for Grammer School then to Pershing Jr. High on 9th Ave. after that. No organized sports for our crew, just the usual Stick Ball, (with a Spalding), sometimes a 2 Sewer Shot, Ally Bat, Stoop Ball, and Baseball Cards which numbered in the hundreds, and which my father threw away when I went into the service, along with my comic book and marbles collection (junk! he called them). Sorry to say, I never forgave him for that. Some people count sheep in bed, I revisit all my Brooklyn Memories of which there are, ironically, too many to count. Thanks for the “Blackout Cake” info. Unfortunately, (no, that’s not right), I live in Naples, Florida and they are not set up for shipping to “Paradise”. I would, however, make it worth your while if you would consider sending me one. If not, I understand and remain grateful. Long live the Loews 46th st and all the other theatres that died a painful death. I posted a few years back, regarding the demolition of the theatre. I work in the area at the firehouse on 12th Avenue, so we would occasionally do building inspection at the furniture store that occupied the former theatre. The entire exterior has completely been changed as well. I’ll take a picture soon when I’m back to work. Such a sad site. I’d rather remember her as she was.